It’s that time of year again—the markets are brimming with end of summer produce: tomatoes, peppers, eggplant, zucchini, and a rich assortment of melons. Oh my. What to do with this rich bounty? 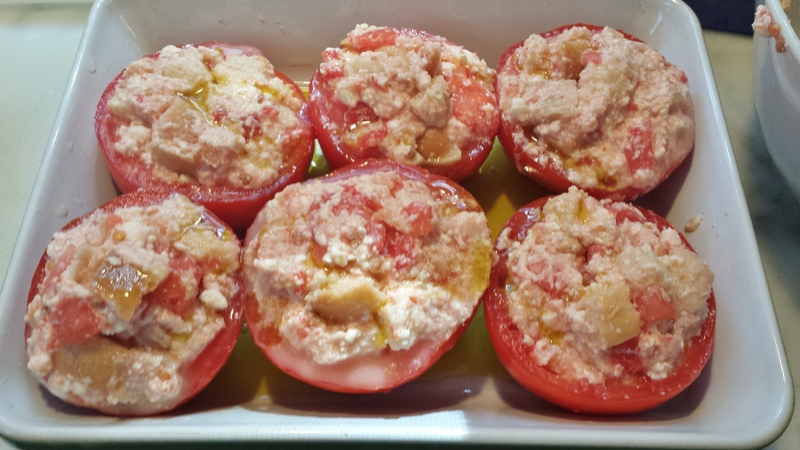 In an earlier post I wrote about the marvelous tomatoes stuffed à la Marie Tèrèse that I swooned over at a restaurant in the Loire Valley. 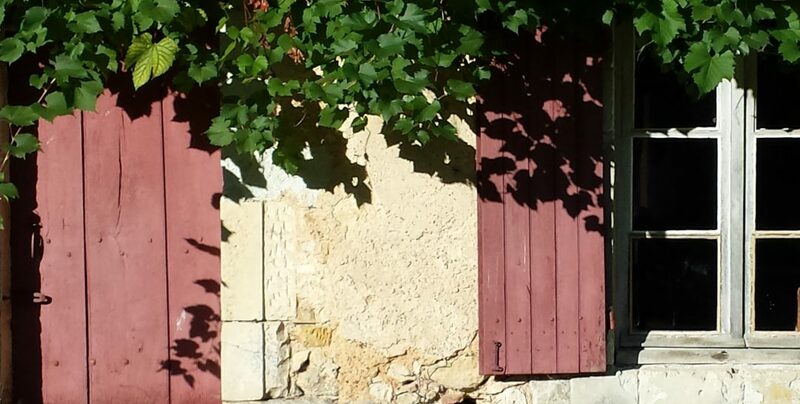 This year I looked to Provence for inspiration and found this recipe in an old issue of Cuisine Actuelle. (I load my luggage with cooking magazines on every trip I make to France, the way other women might with scarves and perfume.) 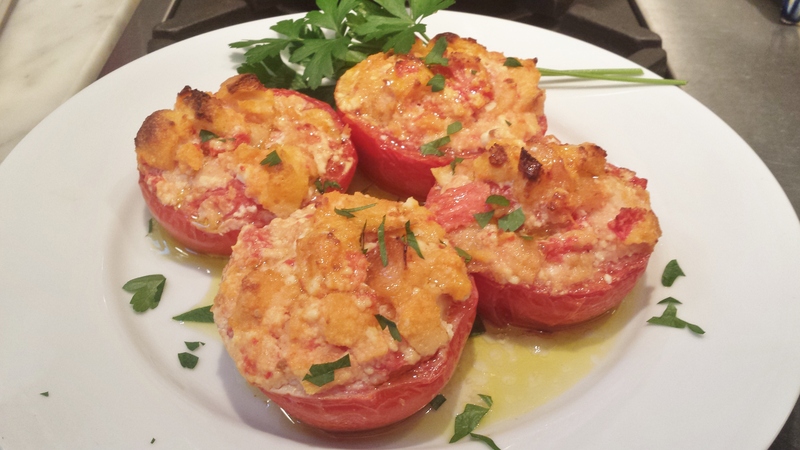 Instead of a meat filling these tomatoes are stuffed with a ricotta cheese mixture. Since the heat here in the Northeast abated for a few days I dared to turn on the oven and make a batch of these today. They’ll be delicious later in the week when temperatures soar into the 90s again. Enjoy them as a first course followed by grilled fish or sausages, or as a light main course with bread, olives, and a green salad. Pour a glass of chilled rose, close your eyes, and imagine rows of lavender as far as you can see. 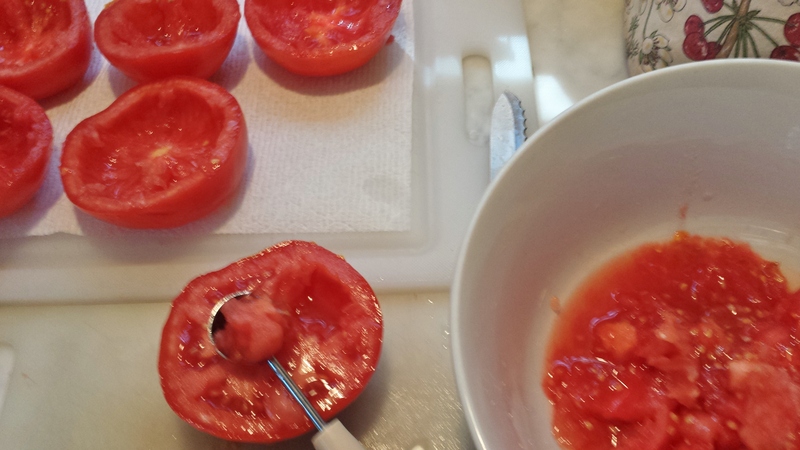 Cut tomatoes in half; scoop and chop pulp. Salt inside then turn over to drain. Mix ricotta, bread, eggs, Parmesan with chopped tomatoes. Fill tomatoes with ricotta mixture. Cut tomatoes in half. Using a Parisian scoop (melon baller) or other spoon, remove the pulp from each tomato half, leaving a wall of about 3/8”. 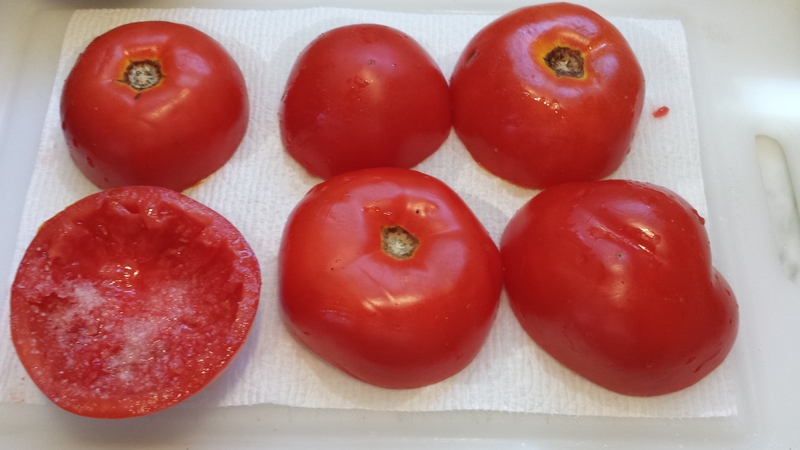 Salt the interior of the tomatoes and turn upside down on a rack or on paper towels to drain for about 30 minutes. 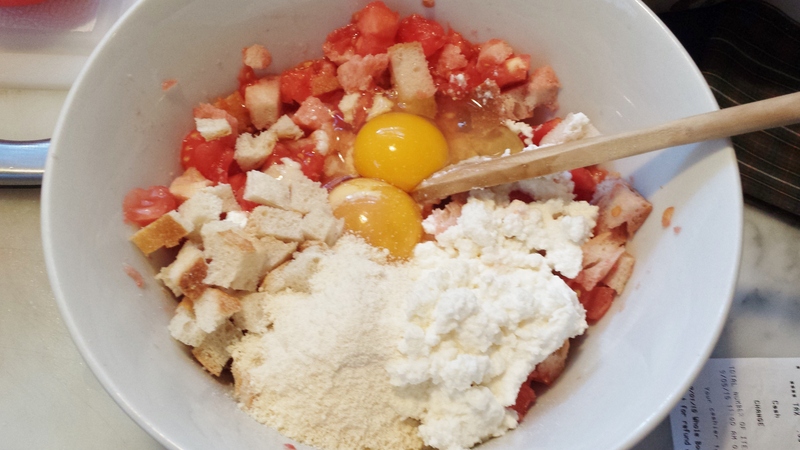 Add the ricotta and eggs to the tomato pulp/bread mixture in the bowl. Add half the Parmesan, salt, pepper and 2 pinches of nutmeg and mix with a wooden spoon to combine. 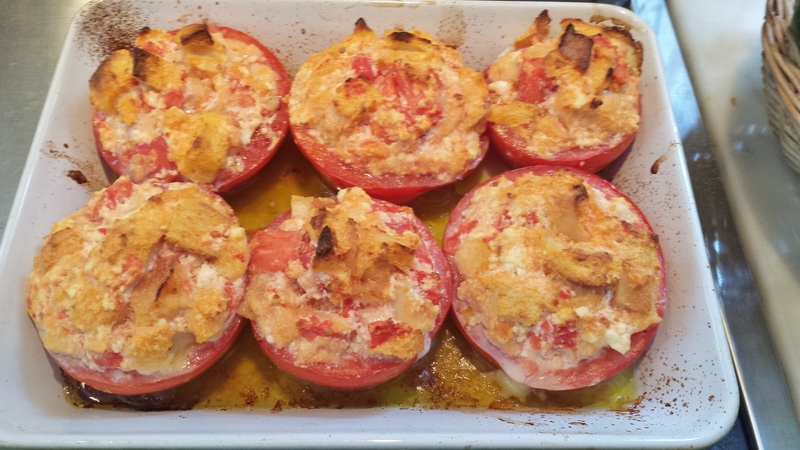 Using a paper towel, blot the inside of the tomato halves, then stuff the tomatoes with the cheese mixture. Use 1 T. olive oil to coat bottom of a roasting pan large enough to fit all of the tomatoes. Place tomatoes in the pan, sprinkle with remaining Parmesan and drizzle remaining olive oil over the tops. Bake for 35 to 40 minutes, or until tops are lightly browned. These tomatoes look so good! I’m a little hungry now. Yum! Now I have another recipe for all the tomatoes in my garden. Thanks Verlee. Very welcome recipe as we’ve had an abundant tomato year. And thanks for the new word “Parisian spoon”… didn’t know that one.